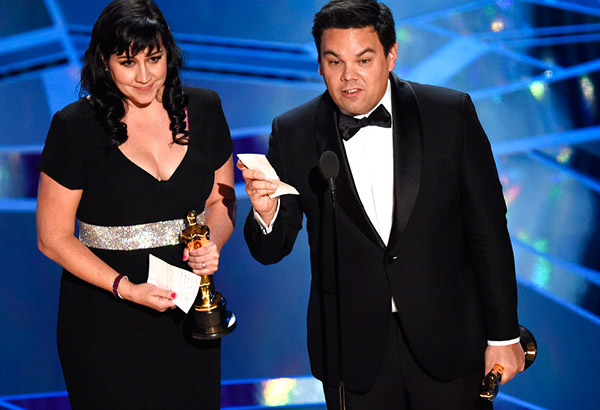 Kristen Anderson-Lopez, left, and Robert Lopez accept the award for best original song for "Remember Me" from "Coco" at the Oscars on Sunday, March 4, 2018, at the Dolby Theatre in Los Angeles. HOLLYWOOD — Filipino-American composer Robert Lopez and wife Kristen Anderson-Lopez were nominated for Best Original Score at the 72nd Tony Awards. The nominees were announced on May 1. “Frozen," the musical adaptation of the animated blockbuster, got three nominations: Best Original Score, Best Book and Best Musical. If Robert wins in the 2018 Tonys, it will be his fourth award from the most prestigious award-giving body for theater productions. In 2004, he picked up his first Tony for Best Original Score in “Avenue Q.” This was followed by Best Book of a Musical and Best Original Score for “The Book of Mormon” at the 2011 Tonys.